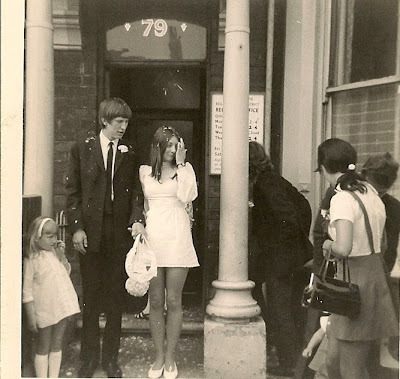 Who were that skinny couple, of yes I remember it was me and Mr FF tying the knot at the registry office in Middlesbrough 20 June 1970. I thought it was really romantic that we got married beside the college where Mr FF was an engineering student. 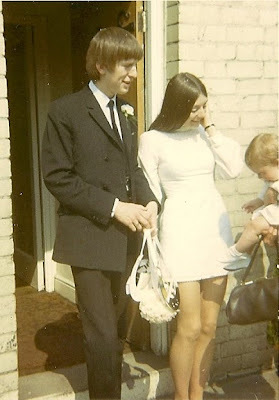 My parents were at the time totally against Mr FF and I being together, especially as I had moved up to Middlesbrough to be with him so we only told a few friends and family what was happening and just got married. It took my family 6 months to come round but they eventually accepted what we had done and we were back to normal. We didn't have a photographer but friends who had taken snaps gave us copies, which I lovingly keep in an old photo sleeve and constantly mislay. My wedding ring cost £7 and my dress about the same, I still have the former though the pattern is all worn away, I have no idea what happened to the dress but I am certain I couldn't get into it now, I weighed 8 stone 3 lbs and I was 21. I don't regret any of it, a wedding arranged in 3 weeks and over in a flash, a marriage that seems to be lasting forever. Congratulations to you both, this post is a wonderful tribute to your marriage. I hope you are having a special celebration here in Italy today. Those pictures are so similar to my parents (41 years today) - Mum was a tiny little thing in a minidress and Dad looked like a 5th Beatle!! Congratulations, what a great occasion. You both look fantastic! These are truly amazing pictures!! What a wonderful tribute to a lasting marriage!! Look at those legs! you made a very handsome couple on the day. Congratulations and it is so nice to see a marriage that has lasted 40 years. I love the photo of you with the bus driving ast in the background! Oh you have made me leak, what a wonderful story - much like my own. Our wedding was arranged in six weeks, when we went around to tell Mum and Dad that we were engaged, my dad kept on reading the newspaper and wouldn't look at us and my mum said the immortal words "I'll believe it when I see it" Well just over six weeks on they did!!! We are only just over half way through your forty years, but I know we will make it. Congratulations to the both of you, I hope you have had a lovely day together and may there be many, many more years celebrating your wonderful marriage together. You haven't changed a bit - well, not all that much. Hope you're having a good time and that today was extra special fun, with no time spent fitting boilers etc. Sunshine here - market went well, but not as many people, which was quite a relief. congratulations!!! Not many marriages last that long these days. Yowza! I'll bet you ladies had to be careful bending over in those short dresses, lest everyone got a shot of your lady-bits. Happy anniversary!!!! Your wedding sounds a lot like ours, even down to the venue (though when we got married it had moved to a new building). The mister here went to that same college, too. Congratulations! And I love that mini dress! How wonderful - 40 years! And you haven't really changed that much at all. What wonderful photos and a lovely post. I hope you both enjoy your Italian celebrations and have many more happy years together. I loved looking at ur special memories, you looked so young, and Happy. Hope ur enjoying ur holiday. OMG, congratulations so much to the both of you, you look so lovely and so blissfully happy in the photos! I was out yesterday celebrating my one month anniversary with my new boyfriend.. I look at those photos and it gives me hope that the feeling that some things are forever are not just a flash in the pan. What wonderful photos! Glad the family came round in the end. Hope the next 40 are worth blogging about too! Hope you're having a smashing time in Italy with suitable flip flop wearing weather too, it's been 35C here in Michigan and I'm looking a little crispy around the edges after a four day camping weekend over American Independence Day. Looking forward to reading the details of your travels (or travails perhaps?!) when you get back. The first time I've stopped by your blog...and I felt like I was looking at my own family album! Too funny, with so much world between us. I guess even back then we were all more connected than we thought. 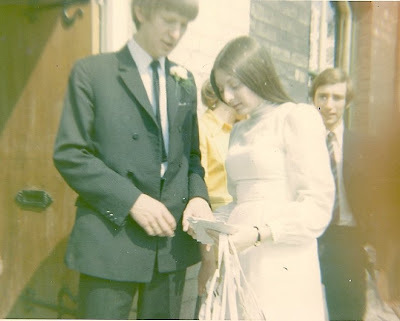 I was married in 1972, and the "fashion faux pas" that was my wedding is something I just wrote about in todays post on my blog! Goodness, how time flies!